Eric D. Schabell is the JBoss technology evangelist for Integration and BPM products at Red Hat. He is a writer, cyclist and software engineer but not always in that order. It’s been some time since we talked about putting JBoss BPM Suite into your cloud and with the new product release it’s time to talk AppDev in the Cloud again. 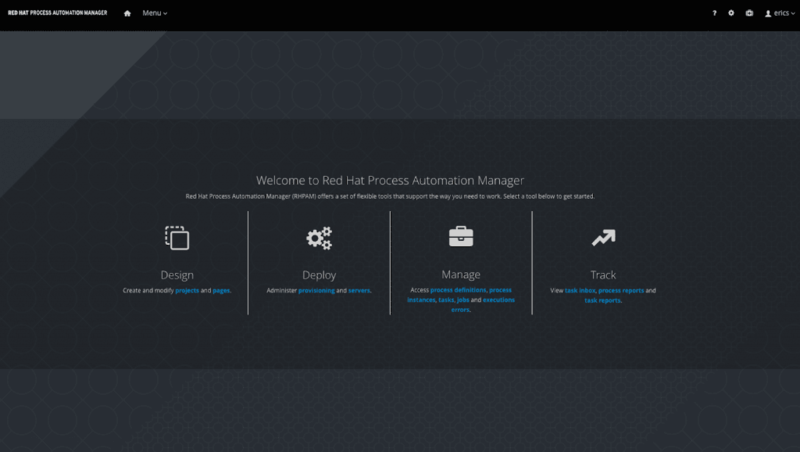 It’s time to update the story and show you how to put Red Hat Process Automation Manager in your cloud. With this easy installation demo project you’re able to leverage process automation tooling through the business central web console running containerized on any OpenShift Container Platform (OCP). Let’s take a closer look at how this works. Below is the outline from the easy installation project, a demo that gets you started in the fastest possible way. The goal here is to get you up and running, with a standard configuration to start your first business rules project. This section will take you through the simple to install example project that gives you a fully operational, fresh out of the box installation of Red Hat Decision Manager. Not only that, it will be a containerized installation that is created on your OpenShift installation! or your own OpenShift installation. Download and unzip this demo. Add products to installs directory. $ ./init.sh 192.168.99.100  # example for OCP. $ ./init.sh 10.1.2.2        # example for CDK. 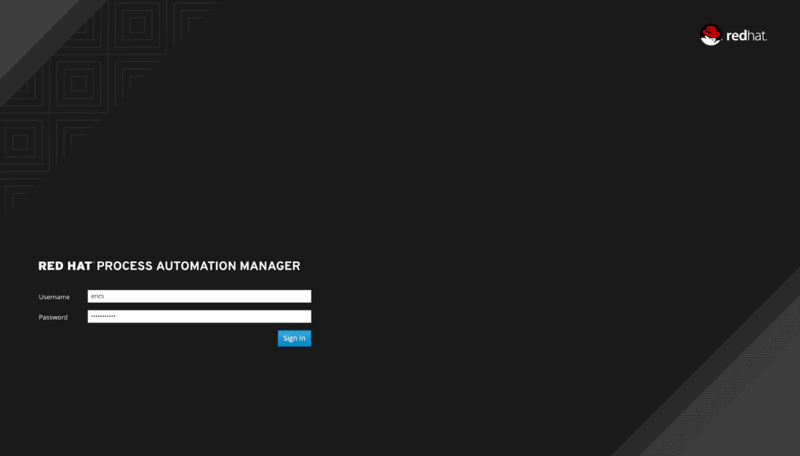 Now log in to Red Hat Process Automation Manager and start developing containerized rules projects (the address will be generated by the init script). Be sure to give the container time to not only start up, but to start up JBoss EAP with Red Hat Process Automation Manager. 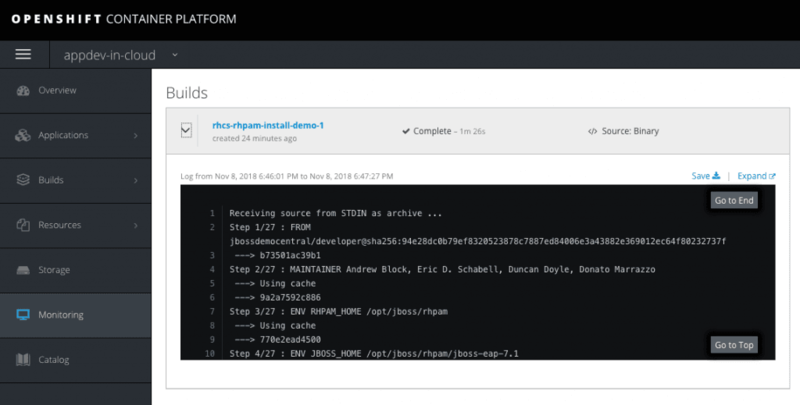 You can check this by finding the deployed pod in the OpenShift console and looking into the logs tab. That’s it, you are now able to start developing process automation projects at your leisure. Stay tuned for more by watching for updates here or following the projects at Red Hat Demo Central. As an extra, you can follow along as the online workshops are updated and the starters kit is updated for Red Hat Process Automation Manager. This includes a separate project with a local installation of Red Hat Process Automation Manager, should you want to avoid containers and cloud deployment. Opinions expressed by System Code Geeks contributors are their own. Do you want to know how to develop your skillset to become a sysadmin Rockstar? Join them now to gain exclusive access to the latest news in the sysadmin and OS developers world, as well as insights about IoT, embedded programming, operating systems, scripting languages and other related technologies. With 1,240,600 monthly unique visitors and over 500 authors we are placed among the top OS resources and development sites around. Constantly being on the lookout for partners; we encourage you to join us. So If you have a blog with unique and interesting content then you should check out our SCG partners program. You can also be a guest writer for System Code Geeks and hone your writing skills!